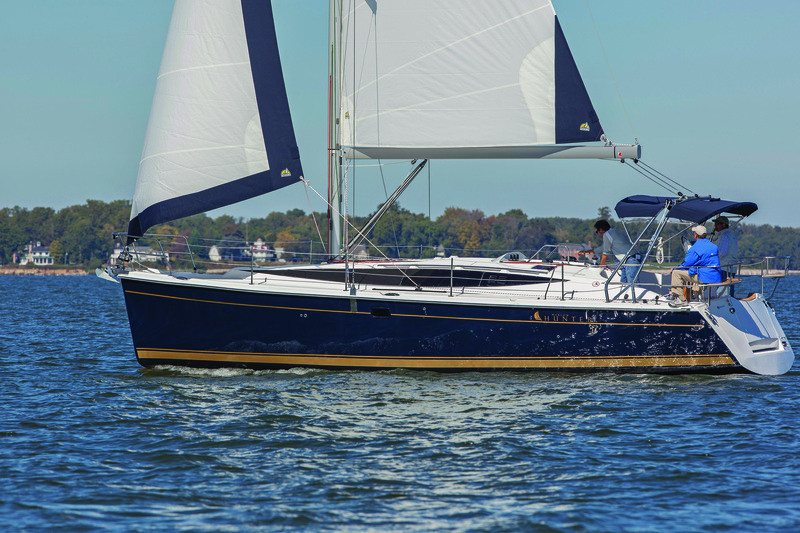 The Marlow-Hunter 37 is a stunning cruiser that is larger than any of her competitors and by far the largest volume sailboat on the market under 40 feet. 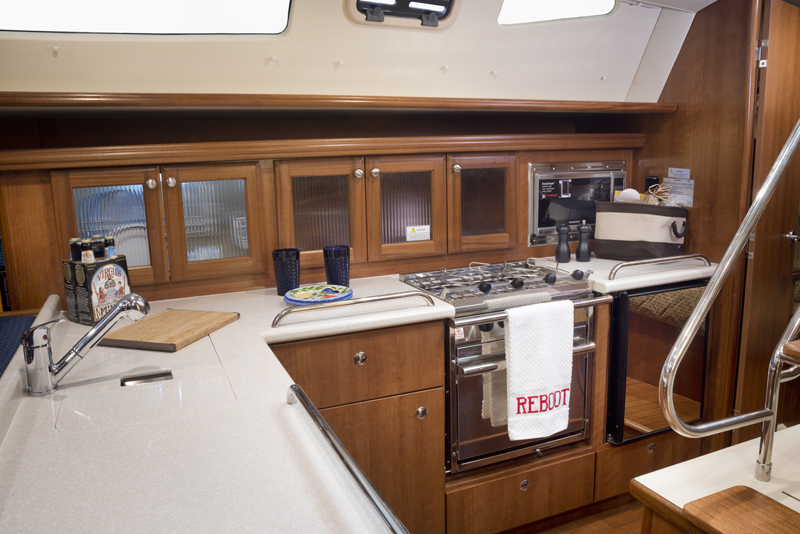 The updated window line gives this yacht a sleek feel, but the improvements do not end there. 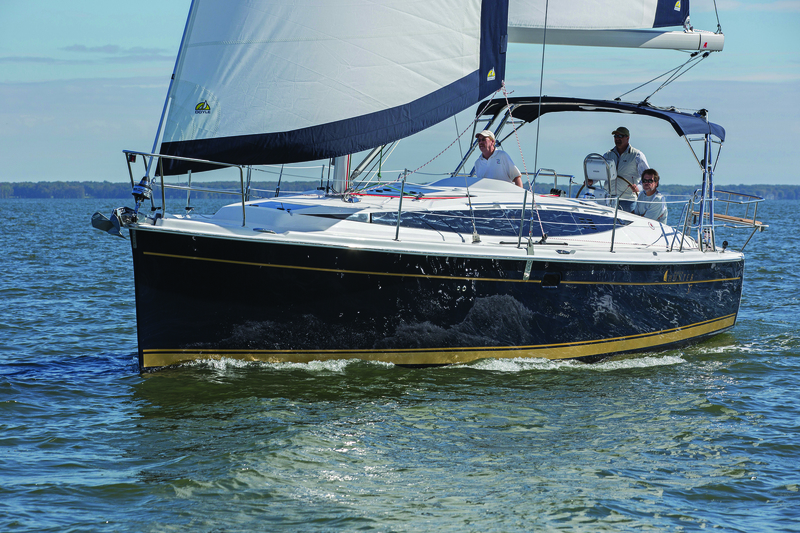 The Glenn Henderson hull design still reflects the bow hollow and stern reflex but the design has been improved upon with a hard hull chine featuring a wider beam carried further aft which allows for more space below as well as stability and performance on the water. 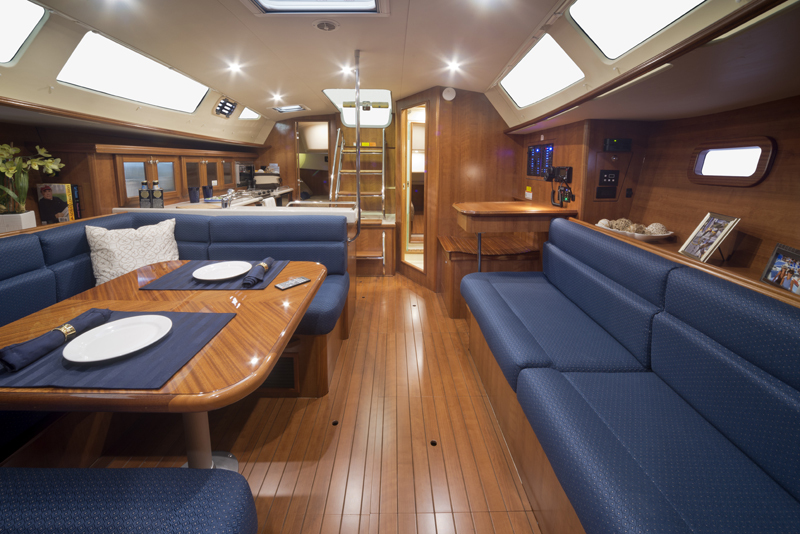 The deck features a sleek, modern profile with large side windows allowing for increased interior light. 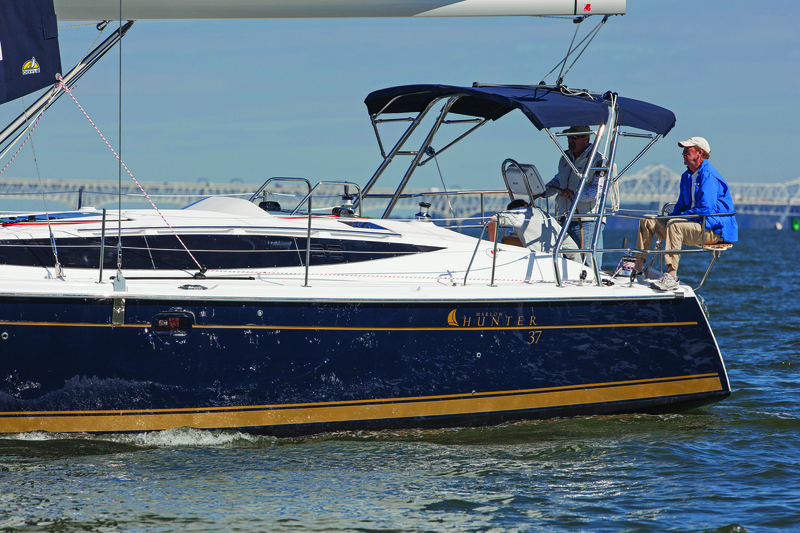 The deck hatches are flush-mount, offering an enhanced look that complements the new profile. Lengthening the cockpit has allowed the MH37 to have a cockpit that is roomier and the fold down cockpit table allows the crew to take advantage of more cockpit space. The cockpit of the MH37 also features a fold-down swim platform that extends the already lengthy cockpit another four feet when folded down while the boat is docked or at anchor. Even with the fold-down swim platform, the MH37 has a telescoping stainless steel swim ladder that can be easily accessed while the swim platform is up or down. 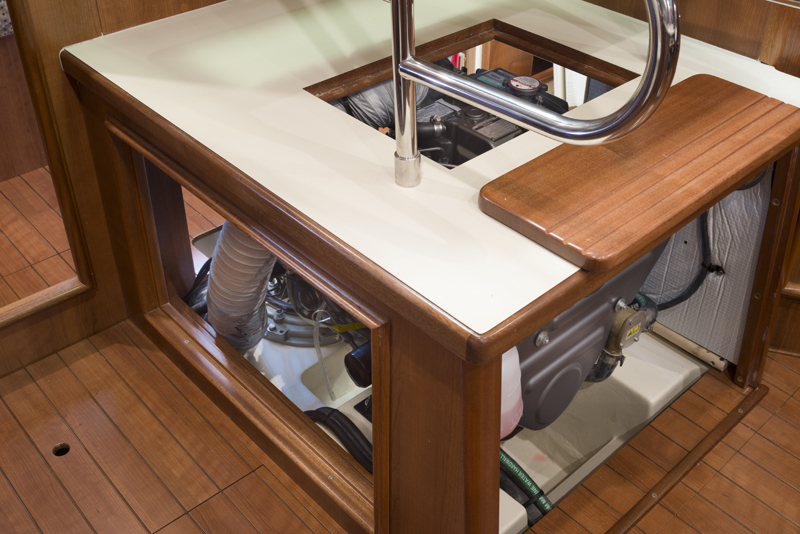 This safety feature not only functions well, providing stable steps for re-boarding the boat, but also hides away, making for a cleaner looking stern. 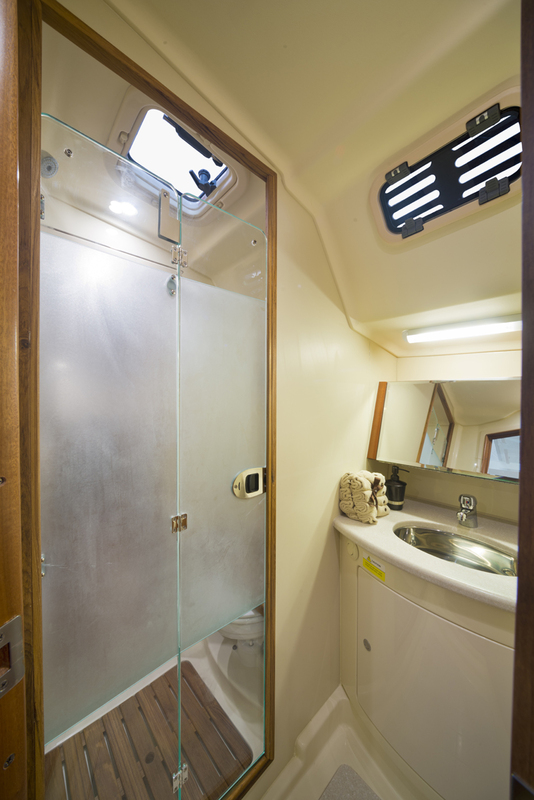 The transom features a large storage area designated to neatly stow away shore power cords. 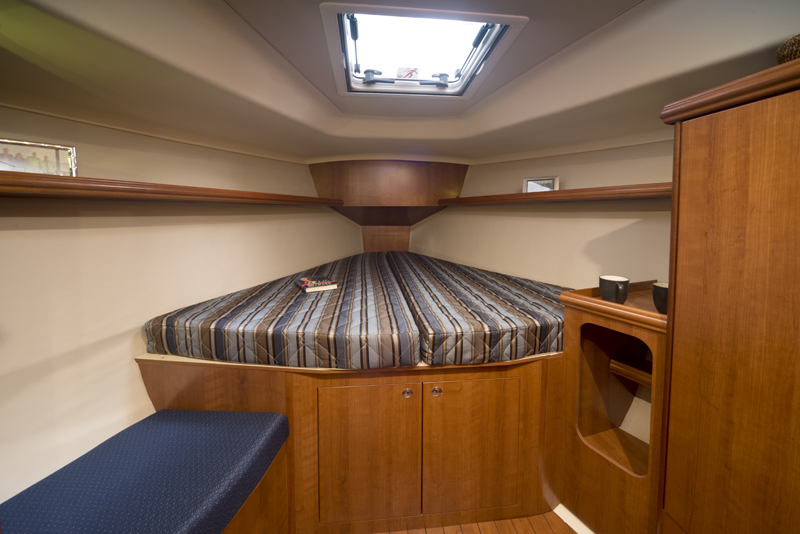 Down below, the master aft cabin is roomy and features comfortable headroom and private access to the head. The interior has been enhanced with a richer look and feel. 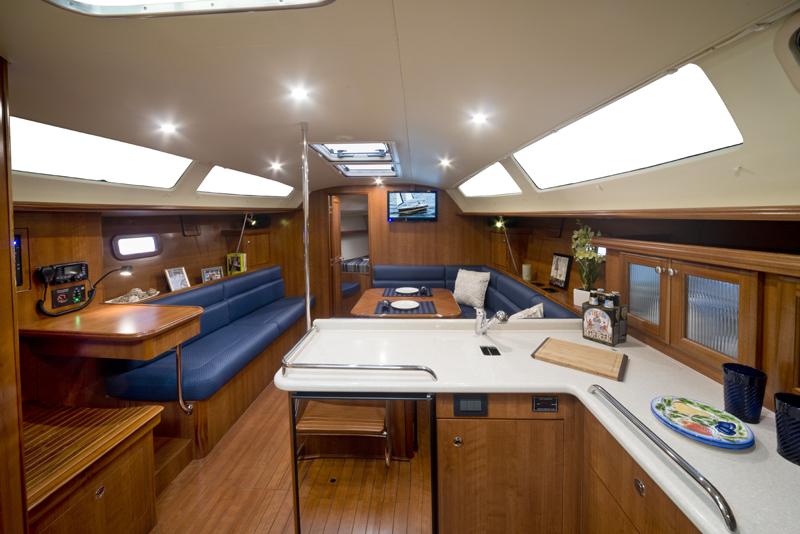 Enhancements start at the sole of the interior which features a hardwood flooring look that accentuates the true beauty of the Marlow-Hunter 37’s interior. 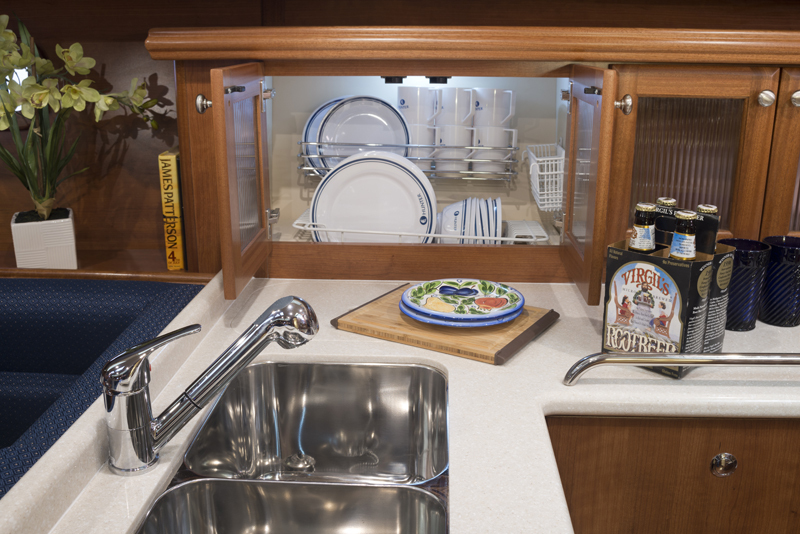 The large galley features Corian countertops with complementing stainless steel fiddles that not only keep items from falling off the countertops in a seaway but also serve as excellent hand holds for personal stability when preparing a meal or moving about below. The main salon is breathtaking from the level of fit and finish to the sheer volume she delivers. 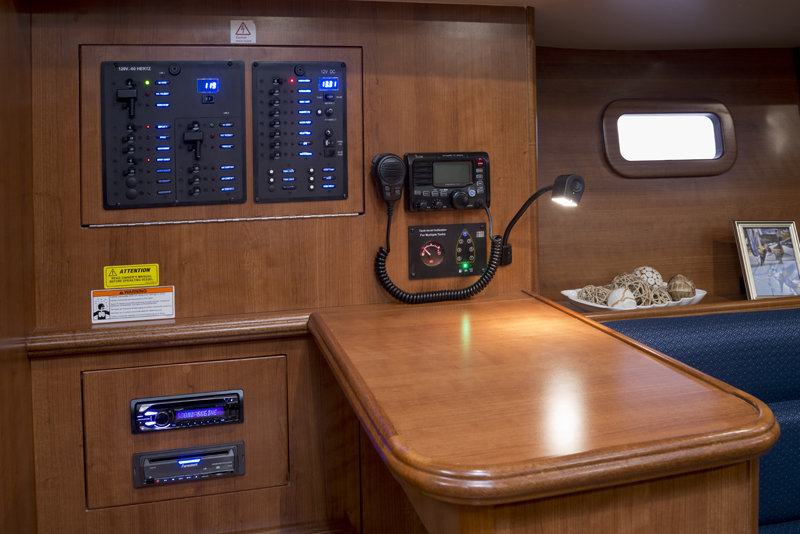 She features a full navigation station and a salon table also doubles as an additional bunk area for 2 people when the table is lowered into the bunk position. 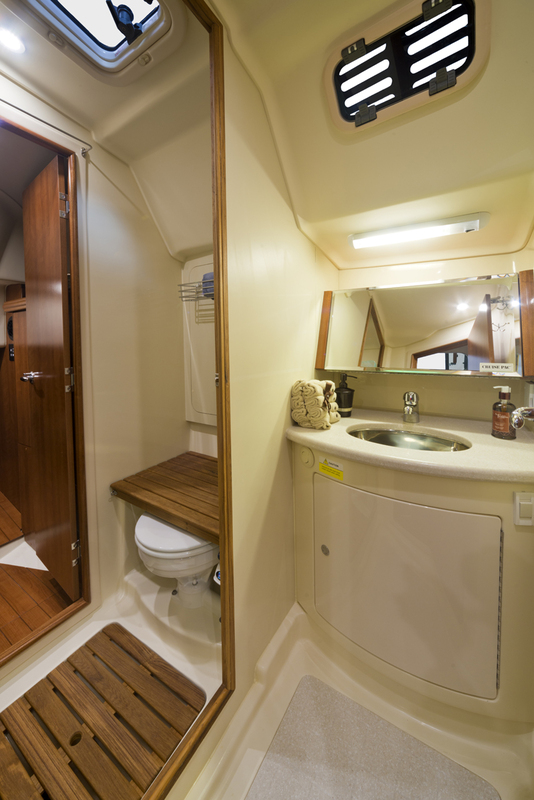 The forward cabin is large enough that it has been mistaken for the master cabin. 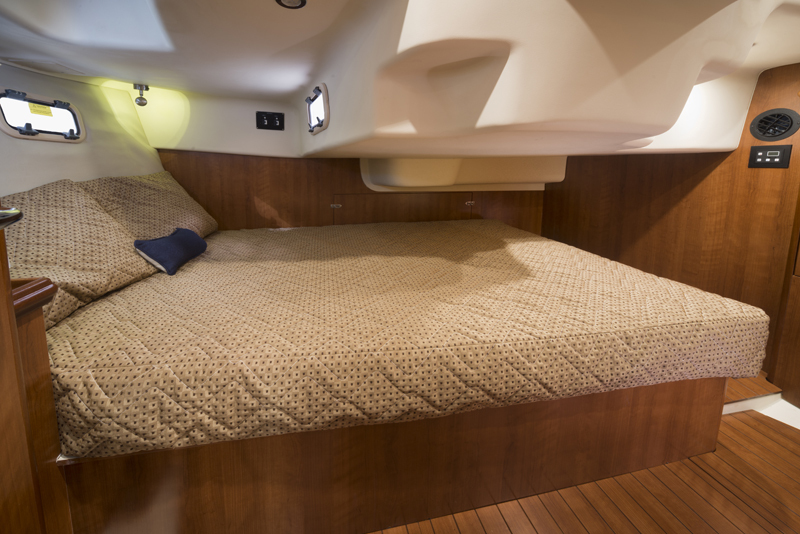 Throughout the MH37 she features seriously upgraded hardware and superior features such as warm LED lighting, dovetailed drawers, ball bearing slides on cabinet drawers, superior fit and finish with real and exotic timber used with high end fabrics to create, an inviting and warm interior second to none. 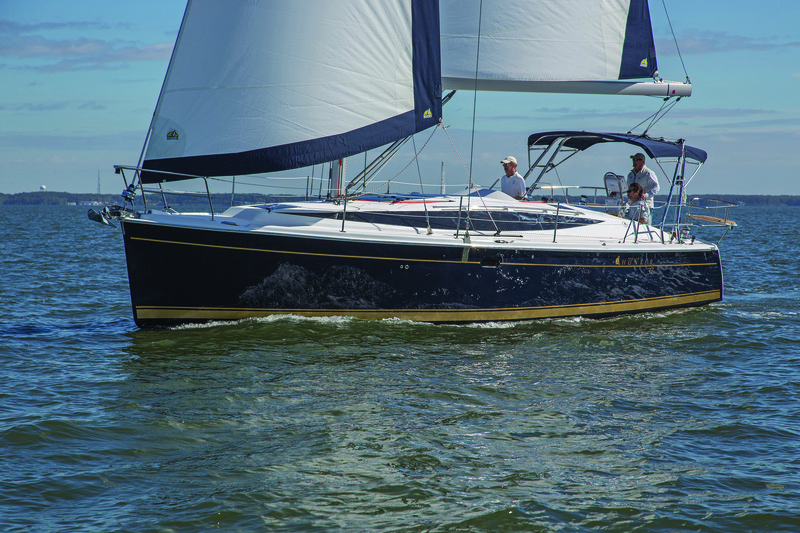 Its high performance hull design provides clearly superior performance on all points of sail while maintaining safe, comfortable and easy handling characteristics in inclement weather. 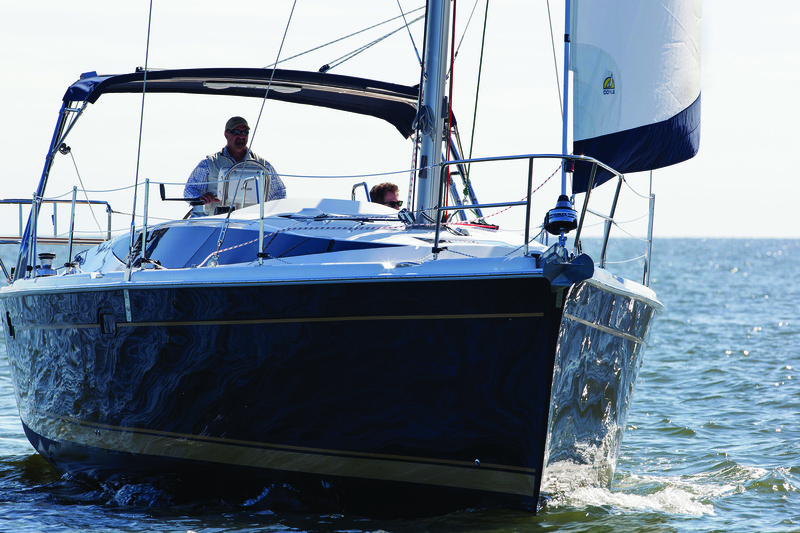 The hardware chosen reads as a who’s who of high quality in way of Lewmar winches, Yanmar engines, Dometic climate control and superior gel coats, resins and build materials. 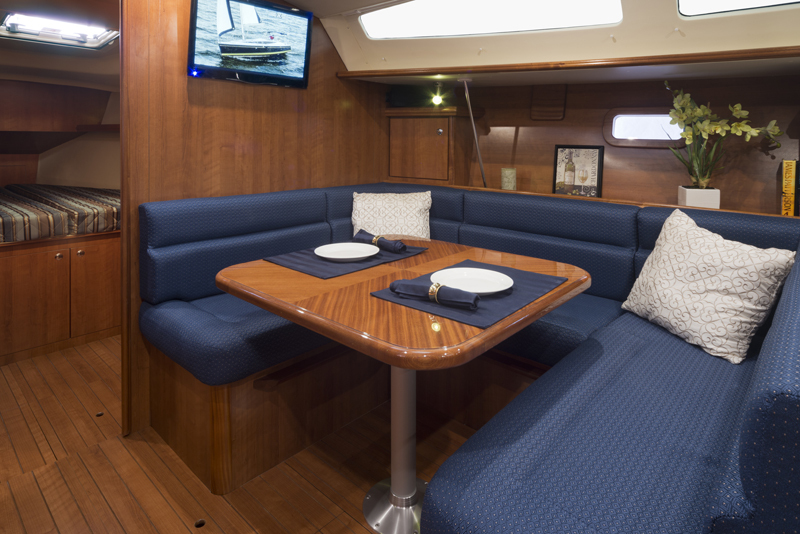 Marlow-Hunters “Grid Truss” hull liner combined with the Dupont Kevlar “Load Path Reinforcement strapping” provides a near perfect finish for the bilge and machinery spaces while adding enormous reserve strength and resistance to the hull structure. 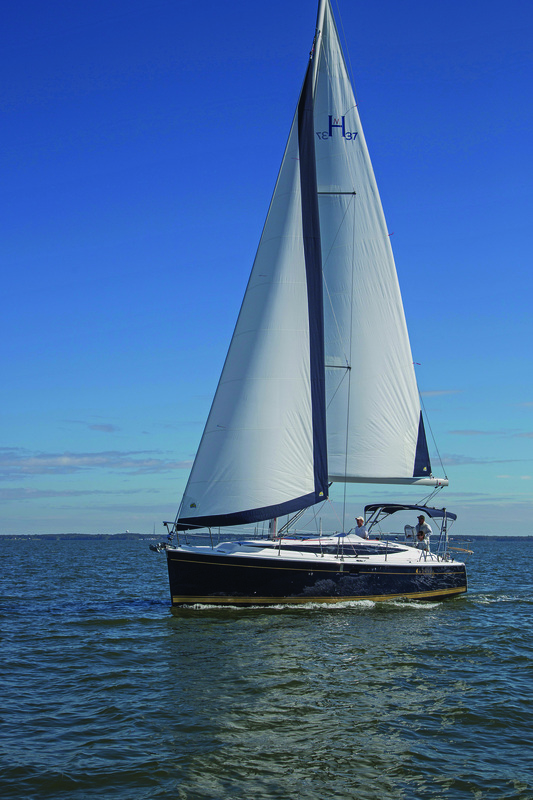 Providing triangulation of all forces from the Patented B&R rig design to the unique keel sump system, the Marlow Hunter cradles its captain and crew in safety with spirited sailing. 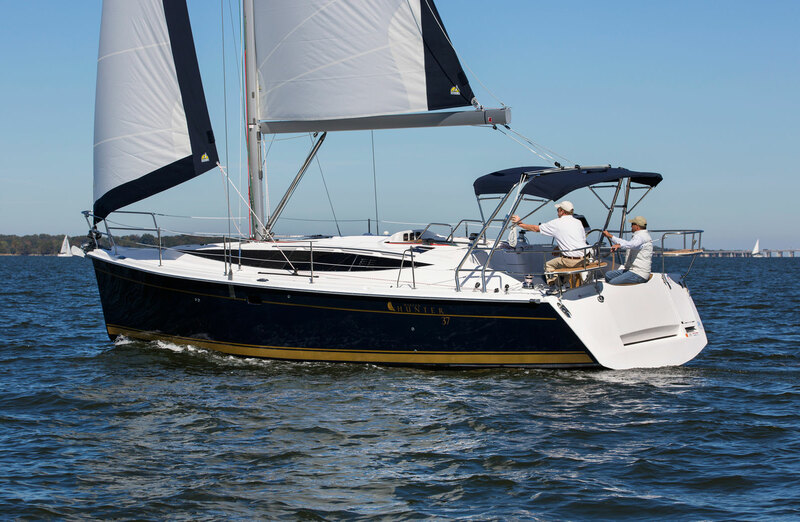 The Marlow-Hunter 37 follows the same development path, providing performance sailing with the largest and most comfortable interior available under 40 feet. 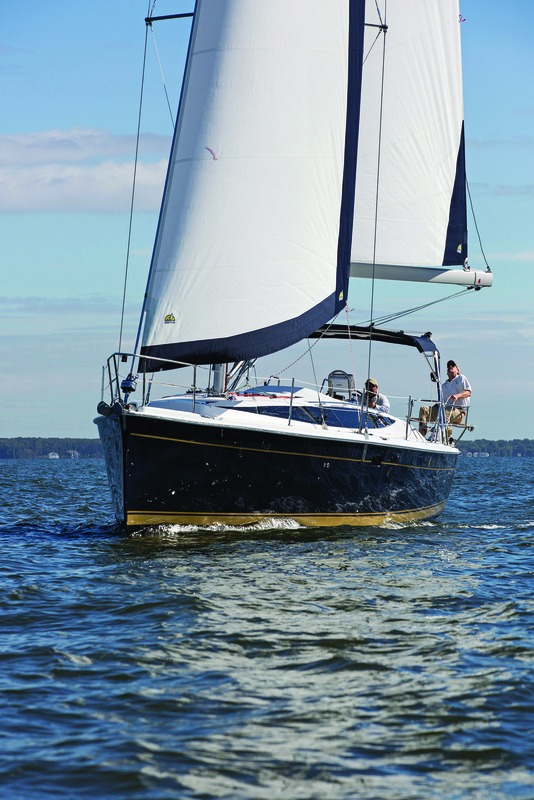 Nicely equipped and ready for you to sail away at $212,731.